Above is an authentic signed card of the New York Giants star wide receiver, Odell Beckham Jr. 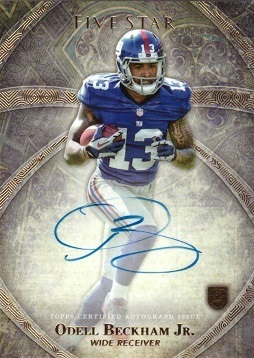 This is a "Topps Certified Autograph Issue", guaranteeing that the signature on this card is of Odell Beckham Jr. himself. All cards are shipped the following business day via USPS 1st class mail, and typically take 3-6 days to arrive. If you need it faster, contact me.